In earlier posts I suggested that declining trend growth for the global economy is going to make for governance problems, particularly for the world’s democracies. I also argued that pre-existing economic problems for three of the four key players in the Ukraine drama – Ukraine itself, Russia, and the European Union (the exception being the United States) – are being aggravated by, and are constraining choices in, the Ukraine crisis. What I want to focus on here is how Russia’s economic problems are impacting Russia’s neighbors and unsettling the region politically. I will leave aside Ukraine (whose acute economic problems I’ve covered in earlier posts) and the three Baltic states (which as members of the EU and the Eurozone are less affected by Russia’s downturn). My argument, in brief, is that Russia’s economic woes are spilling over into neighboring economies, that economic problems are destabilizing regional governments domestically, and that economic weakness is undermining Russian influence in what it understands to be its sphere of influence, particularly in Central Asia. Let me begin with a general observation. The extent to which Russia’s economic downturn, as well as the dramatic decline in the price of oil over the past year, has affected its neighbors has been, and will continue to be, variable. That is also true of the distribution effects within countries (some groups are suffering more than others, and indeed a few are actually benefiting). Nonetheless, the general trend is that slowing economies and declining currencies mean growing pressure on existing elites and existing regimes. So let’s start with growth forecasts for the region as a whole. As Chart 1 suggests, the Economist Intelligence Unit expects “Eastern Europe” (by which it means the non-EU Soviet successor states) to underperform global growth in 2015. 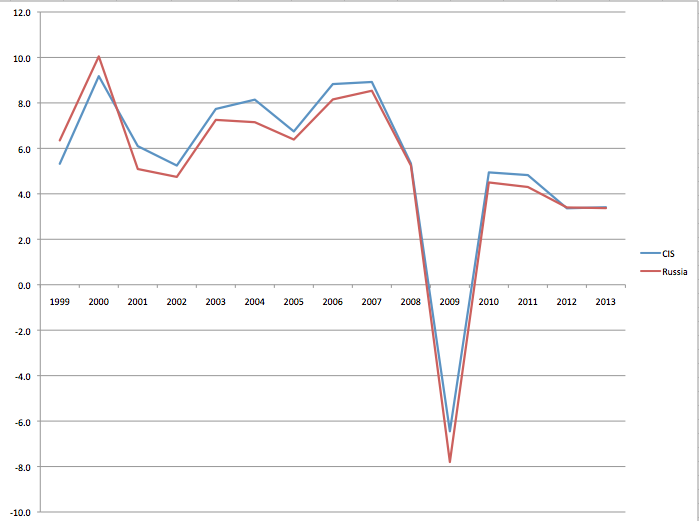 Chart 2 shows that GDP growth for the region has been slowing for several years. Chart 3 summarizes the latest growth forecasts for 2015 by the Economist Intelligence Unit for the twelve non-Baltic successor states. … the liquid international reserves held by the Central Bank of Russia have declined from $257 billion on July 1 to $153 billion on February 13. Considering that Russia’s foreign indebtedness is almost $600 billion and the expected currency outflow is about $100 billion this year, Russia’s reserve situation is approaching a critical limit. At present, Russia loses more than $10 billion a month, which means that a real reserve crisis will erupt in the third quarter. Russian GDP growth has historically tracked regional growth very closely, as suggested by Chart 4 (below), in part because Russia’s is much the largest economy in the region. Aggregate data for the CIS hides considerable variation within the region, and it is possible that there will be decoupling between Russia and its neighbors in the coming years. But my guess is that forecasts for the region have yet to catch up with Russia’s deteriorating situation, and that actual performance across the region is going to be worse than the EIU’s estimates in Chart 3 suggest. In any case, Russia’s financial difficulties have already been putting heavy downward pressure on the ruble, and this in turn has put downward pressure on other regional currencies. 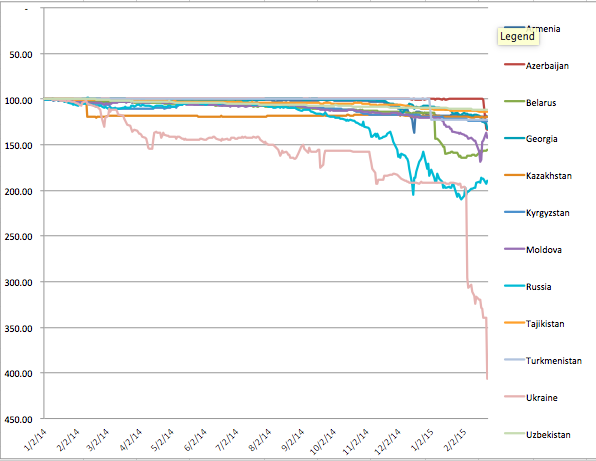 As shown in Chart 5, much the worst performing currency in the region has been the Ukrainian hryvnia, but the ruble has been hammered as well – it is down by almost half against the dollar since the beginning of 2014. 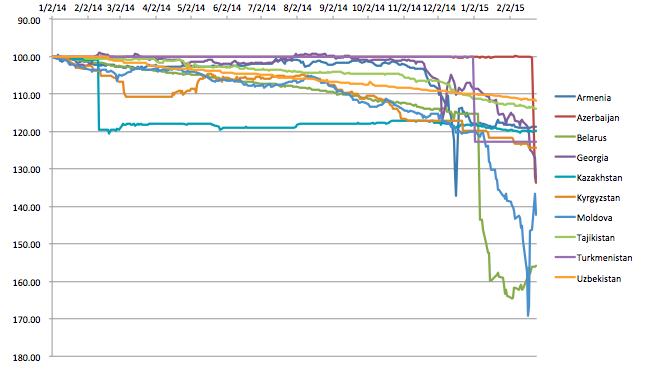 However, Chart 5 also shows that all other regional currencies have declined as well, some significantly. Chart 6 excludes the hryvnia and Russian ruble, which makes it a little easier to see the extent of decline of other currencies against the dollar. The Belarusian ruble has tracked its Russian counterpart most closely. The distributional effects of a falling currency are complex, but on balance it contributes to inflation, especially for imports, and hurts consumers, businesses serving domestic markets, and those with foreign currency dominated debt (e.g., the dollar). Exporters may benefit, however, if increased costs for inputs don’t exceed gains from higher domestic prices for exports. While Russia’s declining economy is doubtless the biggest contributor to the region’s economic problems, the dramatic decline in oil prices since last summer has also been unsettling the region’s economies. Significant oil exporting countries, like Kazakhstan and Azerbaijan, have obviously been badly hurt by falling oil prices, and they have accordingly suffered significant currency declines despite large foreign currency reserves. (The Azerbaijan central bank tried to keep the manat within a dollar band but failed, finally allowing it to fall some 30% on February 22.) Countries like Turkmenistan, which exports mostly natural gas under long-term contracts, are less adversely impacted, which is why growth forecasts for Turkmenistan are still high. On the other hand, oil importing countries like Moldova, Belarus, Georgia, Armenia, Uzbekistan, Kyrgyzstan, and Tajikistan directly benefit from lower oil prices. The net effect for these countries, however, can be negative if the economies of relatively rich oil exporting neighbors, like Russia, Kazakhstan, and Azerbaijan, slow or contract enough to significantly reduce trade, investment, remittances, and so on. To date at least, declining oil prices for the region’s oil importing states have not come close to compensating for the spillover effects of Russia’s economic difficulties. In short, the Ukraine crisis, Russia’s economic woes, and declining oil prices have slowed growth and produced a major sell off of currencies across the region. Indeed, a number of countries in the region are likely to follow Russia and Ukraine into recession, particularly if Russia’s recession proves worse than expected. It is important to appreciate, however, that there is considerable variation in the extent to which the countries of the region can weather difficult economic times ahead. 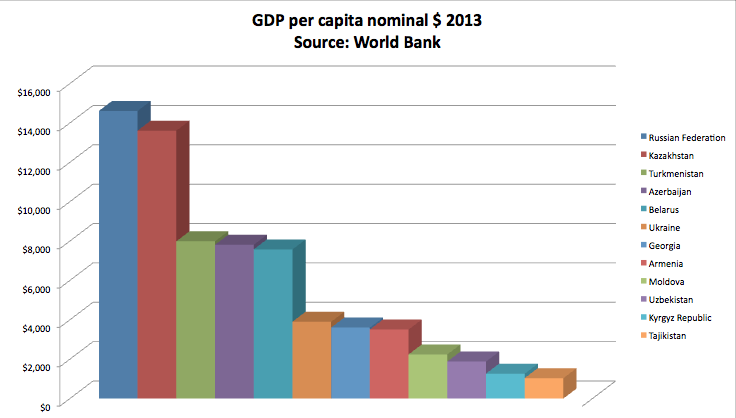 As Chart 7 makes clear, from a relatively similar starting point in 1992, there are huge differences in nominal GDP per capita in the region (this would be true in purchasing power parity terms as well). 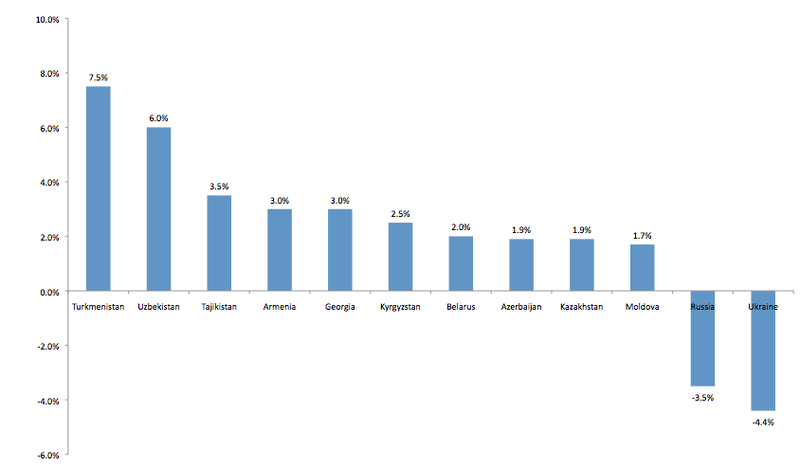 The poorest countries in the region – Armenia, Moldova, Uzbekistan, Kyrgyzstan, and Tajikistan in particular – can ill afford a significant economic downturn, both because so many of their citizens are already living at the margin but also because they lack financial reserves to help cushion the effects of a downturn (unlike, for example, oil rich countries like Russia, Kazakhstan, and Azerbaijan). This is particularly true because the poorer countries of the region have serious unemployment problems, and as a result they export surplus labor to Russia in the form of legal and illegal migrant workers. They are therefore dependent, and in some cases highly dependent, on remittances from workers abroad, particularly Russia, as shown in Chart 8 below. The fall of the ruble, and Russia’s slowing economy, have already led to a significant decline in remittances across the region, as shown in Chart 9 (measured in dollars, the decline would be greater). One important aspect of Russia’s political economy is that wage rates are very flexible – indeed in the 1990s many Russians were willing to work for extended periods even when employers stopped paying their wages. Economic slowdowns or recessions (e.g., in 1998/99 and 2009) have not, therefore, produced major spikes in unemployment (consumption, and living standards generally, fell instead), which makes the political fallout from economic downturns less than it would be otherwise. Russia’s migration service estimates that 70 percent fewer migrants arrived in the country this January compared with last, a consequence of the stringent new regulations as much as the economic crisis. Though solid official figures are difficult to obtain or confirm, local Russian media reports have suggested a mass migrant exodus from Russia. The RBC newspaper has reported that more than 178,000 Tajik nationals and nearly 365,000 Uzbeks left Russia in the last six months of 2014. Part of the reason for the decline in net migration is that new labor laws have made it more difficult for migrants to enter the country or find legal employment. Another factor may be increasing hostility towards foreign workers. But migrant workers are also leaving because there are fewer job opportunities in key sectors of the economy, particularly construction, which suggests that overall employment in the country is declining and may even start to show up in rising official unemployment figures. Still, the most important factor has probably been the dramatic decline of the ruble against the dollar. A weaker ruble, and the inflation that accompanies it, means that migrant workers at the low end of the pay scale have to spend more on essentials, and they accordingly save less and send less home to their families. The purchasing power of what they do send home also declines, at least where the ruble falls more than their home currencies (which so far has been everywhere in the region other than Ukraine). As a result, many of Russia’s migrant workers have been leaving, some to the West, some to China, and some elsewhere, but most to their home countries. The latter are, however, much poorer, and in worse economic shape, than Russia, and as a result returning workers face even worse employment prospects when they get home. That in turn makes for additional political pressure on regional governments, most of which are responding to increasingly tough economic times with new measures to suppress opposition. Whether these measures prove sufficient to keep current governments in place remains to be seen. However, while the region’s mounting economic problems may produce political instability in the region, I think it is very unlikely under the circumstances that political change will take the form of liberalization or democratization – rather the contrary, I suspect. Finally, just a quick word about the geopolitical shakeout from all of this. My sense is that in the long run the most important consequence of Russia’s deepening economic problems are going to come in Central Asia. The end of the NATO military mission in Afghanistan has meant a significant decline in Western interest in, and influence over, Central Asia. 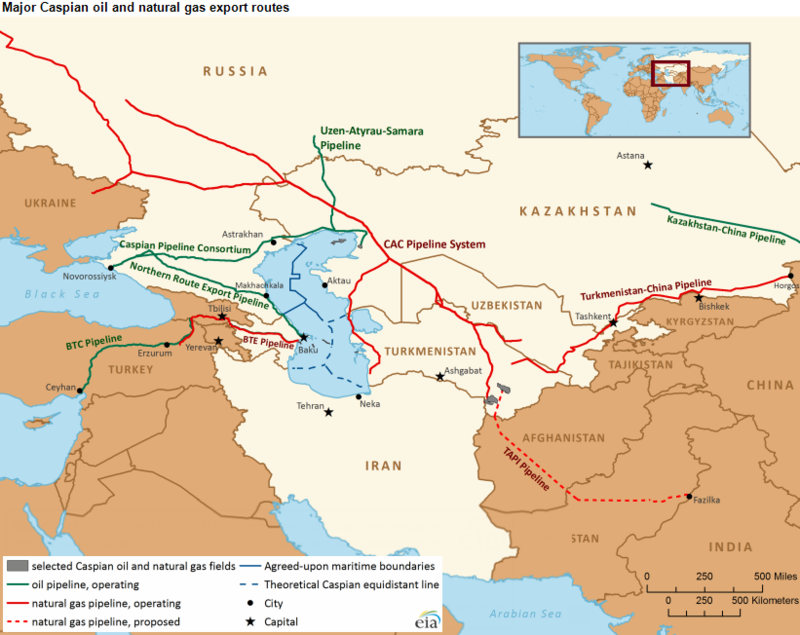 Western governments are still hoping to arrange alternative routes for getting Caspian basin oil and gas to international markets, but my sense is that they realize that their ability to influence developments in Central Asia is much more limited than it was a decade ago, and that in any case it does not matter much where pipelines go as long as they don’t pass through Russia. Increased Central Asian energy exports, regardless of whether they end up in China, Europe, or indeed elsewhere, puts downward pressure on global energy prices and reduces Russian leverage in the region, and that is the primary Western energy interest in the region. At any rate, the key external players in Central Asia are now Russia and China, and no longer the United States and its Western allies. Moscow and Beijing share important strategic goals, most notably a desire to counter U.S. power generally and in their neighborhoods particularly. They also have a common interest in preventing radical Islamists from gaining influence in Central Asia. They have therefore formed what can reasonably be called a strategic partnership, which was highlighted last year by the signing of a $400 billion multi-year contract to deliver natural gas from Russia’s Siberian fields to China’s east coast. Beijing has also refused to condemn Russia’s annexation of Crimea, despite its long-standing sensitivities about separatism and insistence on “non-interference” in the domestic affairs of other states. It has also been careful to downplay its growing presence in Central Asia, which the Kremlin considers part of its, not Beijing’s, rightful sphere of influence. Nonetheless, China’s economic commitment to Central Asia has been increasing by leaps and bounds. 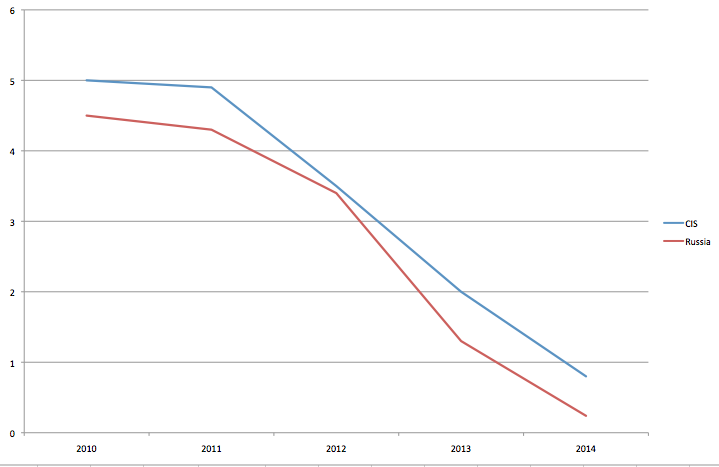 In 2012, China’s total trade with Central Asia was almost twice Russia’s. It is now the largest trading partner of four of the five Central Asian countries – Tajikistan, Turkmenistan, Kyrgyzstan, and even Kazakhstan, which shares a very long border with Russia and has a large Russian-speaking population in the north. The exception is Uzbekistan, which has been wary of deepening economic ties to China, but that too is rapidly changing, and China is now Uzbekistan’s second largest trading partner. Beijing has announced two major initiatives – which it has labeled its “March Westward” and “Silk Road Economic Belt” projects – to deepen economic ties to the region and increase overland trade between China and Western Europe. There is already a major natural gas pipeline from Turkmenistan to China (see map below), and as a result Turkmenistan now sells more gas to China than to Russia. Meanwhile, gas exports from Central Asia to Russia have fallen some 60 percent since 2009. There are also plans to build a second gas pipeline from Turkmenistan and one pipeline from Kazakhstan to China. Chinese foreign direct investment (FDI) is also much greater than Russia’s, with multi-billion dollar investments in the energy sector in Kazakhstan ($30 billion), Uzbekistan ($15 billion), and Turkmenistan ($16 billion). And China has established a $16.3 billion fund to finance the construction of new railroads, pipelines, and roads across Central Asia. The basic problem for Russia is that the Chinese economy is now some 4.5 times larger than Russia’s, with a much higher trend growth rate. Russia would have been unable to match China’s economic involvement in Central Asia even before Western economic sanctions and declining oil prices made an already weak Russian economy even weaker. But with Russia preoccupied by the Ukraine crisis and its confrontation with the West, and with a shrinking economy, declining foreign currency reserves, and less capital to invest abroad, Moscow is inevitably going to be supplanted by China as the dominant external power in Central Asia, first economically and then politically. It will also find its ability to use, or threaten to use, hard power in the region constrained by China, which will certainly not want to see a Ukrainian scenario play out, for example, in Kazakhstan. The task for China is to affect this transition without threatening its strategic partnership with Russia in other areas. For regional governments it is to balance relations with both powers so as to avoid the kind of crisis currently afflicting Ukraine. And for Russia, ironically, it is not very different from the West’s with respect to China broadly – accommodate China’s growing power without allowing a positive sum game to turn negative sum. ← Whither the Donbas war after Debaltseve?